Because students grow tremendously through an experiential curriculum, the NIU College of Education embeds diverse, real-world learning opportunities in our programs. We similarly place a great value on collaborating with schools, communities, agencies and businesses that expand local and global opportunities for learning, research, service and leadership. Our "Educate and Engage" series offers many unparalleled experiences in which our students apply what they learn and are supported in their transition to professionals. The Educate series offers opportunities to our licensure candidates while our Engage series offers opportunities to our non-licensure students. We're proud to offer these local, national and international experiences at no cost or very low cost to our College of Education students. All NIU College of Education students may participate in the Educate and Engage Recognition Program. 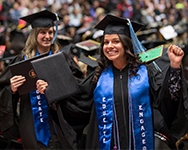 You may use hours gained by participating in engaged learning experiences to qualify for a Educate and Engage recognition stole to wear at commencement. Hours earned through school-coordinated projects, registered student organizations or self-arranged volunteer activities that are beyond requirements for core classes can be counted. Places of service may include, but are not limited to, libraries, hospitals, clinics or other settings where students can validate engaged learning. Check with Jenny Johnson at jljohnson@niu.edu if you have questions about the suitability of an experience. You must complete a minimum of 144 clock hours, in at least two distinctive settings. Only the actual work time can be tallied (e.g., travel not included). In order for you to qualify for the Educate and Engage Recognition Program, engaged learning hours must be documented on Recognition Stole Program Form (PDF) and submitted to Graham Hall 329 prior to November 15th for December graduation recognition, and prior to April 15th for May graduation recognition. Candidates submitting forms after the published dates, but prior to commencement, will receive a certificate of recognition.